View the pictures to see the difference between front and back rolls. 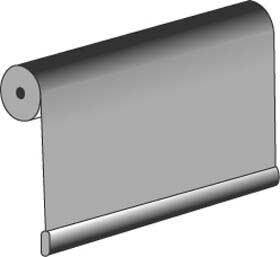 Front Roll: Is ideal for customer who don't want to see the roll at the top of their window. The fabric comes off the front of the tube so the tube is hidden behind the fabric. In RECESS applications its good for allowing a little extra clearance for clearing window handles. 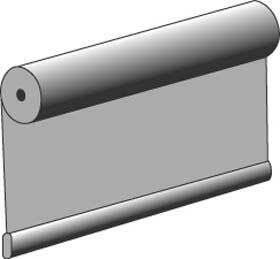 Be careful when ordering Front Roll when mounting your blind on the face of the wall as it will give much larger gaps as the fabric will not be as close to the wall as when you order back roll. Back Roll: This is the most popular way of having the fabric hang off a roller blind tube, it keeps the fabric as close to the window in recess mount and it also keeps the fabric is as close to the wall when FACE mounting the blinds. This means the best heat and light reflection. One thing to watch for is handles, if your fabric comes off the back of the tube, it could hit the window handle or hinges. Either mount your blind further forward or order it as front roll.